Nine Years ago this very day, I was ordained by the Right Reverend Robert Duncan of Pittsburgh. This happened on a Saturday morning in Moon Township, Pittsburgh, PA. 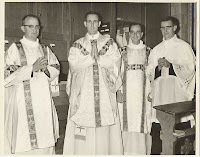 I was made Deacon, and six months later made Priest. Since then, I have served three congregations and had three bishops. I have left one Province of the Anglican Communion and been received into another. I have preached hundreds of sermons, taught hours of classes, officiated scores of weddings and funerals, celebrated the Sacraments with countless crowds, counseled with people in pain, studied the Word of God, and prayed not nearly as ceaselessly as I would have wished. I have fulfilled many roles, often without realizing it, as an object of both too much love and too much hate. Also on this day, eight years ago, my family and I moved to Nashville from San Antonio. So the vast majority of my ordained ministry has been within one part of one metropolitan area. I have seen amazing things. I have seen people put their faith in Christ for the first time. I have witnessed reconciliation and love. I have celebrated Midnight Mass in a Church of Christ sanctuary. I have seen old men and women act with the heroic spirit that the movies reserve only for the young. I have been supported and cared for in the darkest moments of my life. And I have seen terrible things. I have seen inexpressible pain and heartbreak. I have seen cruelties, small and large, used as substitutes for difficult conversations. I have seen ordained people, priests and bishops, act like they were part of the Mafia instead of the Family of God. And God knows I have sinned right along with the worst of them. I'm glad I have been both husband and father longer than I have been a priest. It puts me in mind of the words that Bishop Duncan spoke to me just a couple of days before he laid his hands on my head. He said that someday the Church would ask me to choose between It and my family. And on that day, I should choose my family. I believe I have generally done a good job of heeding those words. I am happy in my vocation (though not always!). I am glad for the Church I serve, as well as the congregation I serve in. It has been a difficult nine years, but I'm thankful for them. Worship continues . . .